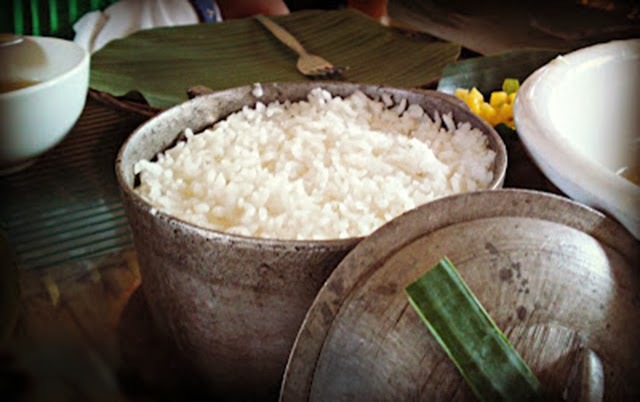 The thread that weaves through nearly every Filipino table from Luzon to Mindanao is the humble grain of rice. Whether served as the most important component of a meal or as the basis of a quick snack, rice is what Filipinos equate with sustenance. Without flair or flourish, steamed white rice is ideal. Long-grain indica varieties are the most widely grown on the islands, which include the jasmine-like milagrosa variety that is so popular for its floral aroma and fresh-cooked stickiness. Many Filipinos rely on their electric rice cookers to steam rice to fluffy perfection, but equal results can be achieved on the stovetop. 1. Place your rice in a large deep pot. Wash the rice thoroughly in several changes of water until the water runs clear. This washing will give your rice a cleaner flavor and whiteness. Drain all of the water from the rice. 2. Pour 5 cups water into the rice pot. Cover the pot and place over high heat. Bring the water to a boil. This may take 5 to 7 minutes. 3. Turn the heat to the lowest heat setting and allow the rice to steam for 12 to 18 minutes until the rice is tender and all the liquid has been absorbed. 4. Turn off the heat and allow the rice to continue steaming for 10 minutes before removing the cover. This method of cooking rice yields a fluffy, moist, and sticky rice. After you have washed your rice, add a 5-inch pandan leaf to the pot. Cook the rice as directed.